Book making is next on my crafty to-do list. This book would certainly help!!! What a great book! 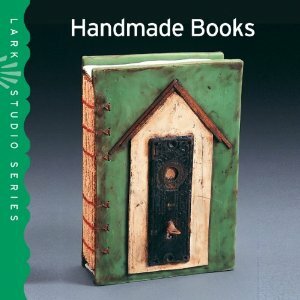 Handmade books are wonderful... I adore the cover!! This looks like a wonderful book! I love books and especially hand-made ones. I think it is pretty neat that they are allowing you to give one away. I love handmade books so I would love to win this, the cover looks fab. Thanks for review and info on this book - I'd love to win a copy and get inspired to make more books! I tweeted this contest out. Pick me! This book looks so cool! I wannit! Thanks for the review. fantastic book thank you so much for the chance brilliant stuff! Hi - I want to see what these mixed media artists are up to - please enter my name in the drawing. This is a very beautiful book and I would love to win it. Handmade books are the best. This book looks so cool! I bet the content is great also! I just discovered your Blog via Google Alerts which I discovered via EGA groups. Love the internet. Now back to embroidery. Thank you and Lark Books for such a great contest! The book looks awesome! I'd love to check it out! I'm an art teacher, k-8 and would love to use this in lesson plans. What a wonderful book, I would love to win this as I love making books!!! This looks like a fabulous book so nice to have a chance at winning it ! glad i came across your blog i will be back for sure. Keeping my fingers crossed ! I love handmade books, and I would most certainly love to win this one. I've never seen a Lark book I didn't love. I am happy I found your blog today, not just to be entered in the drawing for a free book, but because I found your information informative and inspirational! I love Lark books and this one I really want. I have just started making my own handmade books and need all the help I can get. Fingers and toes are crossed. Great blog - would love to win the book. Will visit again.